Some union members also crossed picket lines and decided to work during the first strike, BA said. London, England (CNN) -- A second five-day strike by British Airways cabin crew members was set to start Sunday after talks between the union and the airline failed, mediators said. The two sides met Friday under the auspices of the Advisory, Conciliation and Arbitration Service (ACAS), but talks were adjourned without an agreement, ACAS said. "ACAS will be in contact with both parties to arrange future talks," it said in a statement. A five-day strike by the Unite union, which represents most of BA's 15,000 cabin crew members, just ended at midnight (7 p.m. ET) Friday. The next strike is planned for five days from Sunday and another five days starting June 5. The dispute centers on pay and working conditions for cabin crew. Is BA's reputation in a tailspin? "The cost to BA of ending the strike is nothing, as cabin crew have offered a pay cut," Unite said Friday. It said the strike so far has cost the airline 84 million pounds ($121.4 million). 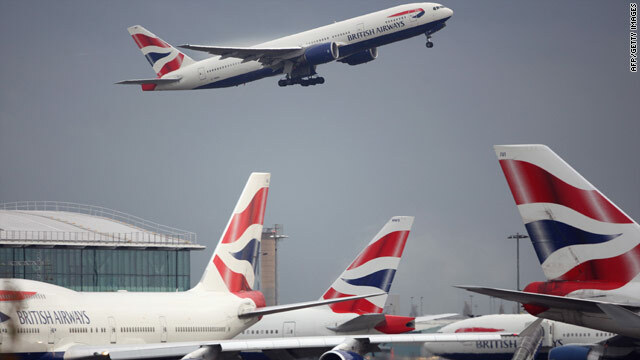 British Airways has said it has managed to fly more than half of its scheduled flights during the strike as a result of leasing planes and pilots, and putting passengers on other airlines. Some union members also crossed picket lines and decided to work during the first strike, BA said, enabling the airline to expand its planned schedule for the second strike. All flights from Gatwick will operate as scheduled, the airline has said. BA said it expects to fly more than 75 percent of its customers who already have reservations during the strike that begins Sunday.